afreegreek wrote: Red Oak??? .. good God, my eyes! What's wrong with red oak? hay can someone post a pic or a good drawing of how to hook up a 12V 1A Low Dropout Regulator, I see it has 3 prongs, but I am at a loss at how to wire this thing in, I am about to install some LED overhead lights in my camper and this sounds like good insurance. 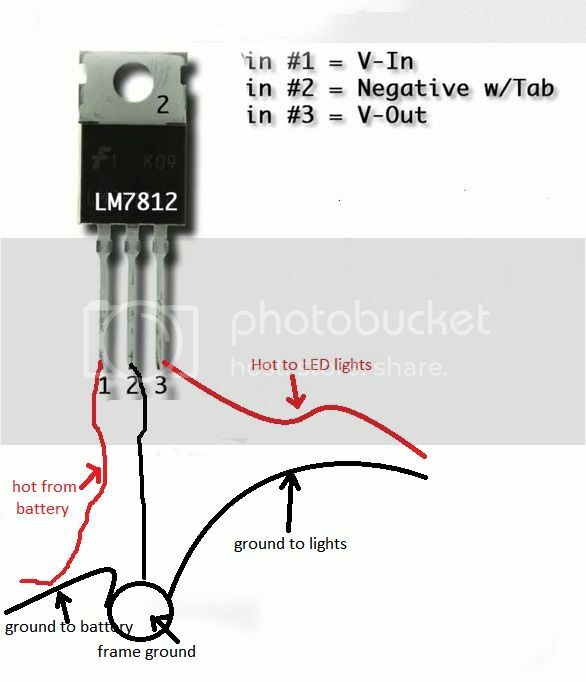 Is this correct, would it work, I have all my LED lights grounded to the frame by running two wires all teh way, I didnt want to trust grounding into teh aluminum siding like it was done from the factory. what do I do with the hole in the top? can I just screw it into the frame by putting a screw through there or what? It's worth it to just buy some "led drivers" they cost like $2 and do the job perfectly. I buy a lot of my led components from dx.com but be warned, shipping take a long time! The ideal regulator, or driver, for led is constant current, not constant voltage. But they both work fine. I want them for the caboose as down lighting. Is a dropping resistor needed to run the lamps ? Anyway to predetermine the pos/neg lead ? Should I just hook them up and experiment which way is brighter? Do I dim them by simply reducing the voltage ? I'll take a picture tomorrow ! $30.00 plus as a retail price. Had a couple minutes this morning before leaving for work so I rigged up a wire set for one of the flood lamps. Inside my sisters garage in total darkness I touched the feed wires to the battery in my little Suzuki and BOOM! It was almost day light in one corner of the garage. Looked up 200 lumens and found that equates to about 60 watts but the fact that is it is a focused reflector equipped flood lamp makes it seems much brighter. I have requests in with a couple of lighting outlets to supply me with recommendations for a dimmer or dimmers. I hope to install the lamps in banks of 4 to 6 per circuit in the caboose.